Public Policy Polling is out with their 3rd annual TV news trust poll. 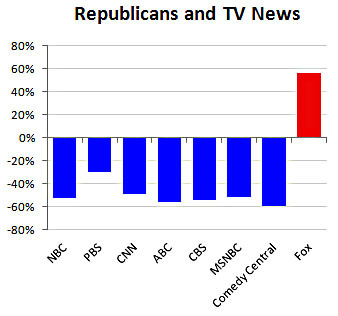 Among Republicans, as the chart on the right shows, the shape of the river is simple: they don’t trust anyone except Fox News, who they adore. These numbers are spreads, with NBC, for example, garnering 17% trust vs. 69% distrust. Fox News, conversely, garners 73% trust vs. 17% distrust. Here in Washington, almost no one in either party is crazy enough to think that the Politico is actually a left-wing rag, an ideologically-motivated news outlet whose purpose is to advance the liberal cause. And whether this talk show host’s listeners know or care much about it in particular isn’t my point. My point is this: If you are a consumer of conservative media, you get constant reminders — every day, multiple times a day — that you absolutely must not believe anything you hear or read in any news outlet that is not explicitly conservative. Everybody — yes, everybody — is subject to confirmation bias. We all get the warm fuzzies when someone tells us something we want to hear, and we resist listening to people who tell us things we don’t want to hear. But there’s still a difference. As Paul says, “Conservatives and liberals are not equally prone to huddle within their self-reinforcing cocoons.” Liberals don’t immediately dismiss as a conspiracy everything they hear from the news media that doesn’t fit their preconceived notions. They might downplay unwelcome news or even ignore it, but they’re still willing to listen to it. Increasingly, conservatives simply aren’t. They want to believe the world is a certain way, and they’re just flatly not willing to countenance anything that might challenge those beliefs. This is not a healthy development for a modern democracy. UPDATE: Chart edited to show the correct figure for the Fox News trust/distrust difference (56%, not 73%). Thanks to reader Dan H. for catching the error.